As with any professional endeavour it’s common for even the most seasoned public speakers to make mistakes. What sets apart the best, though, is their ability to learn from their gaffes. Here, we’ll explore seven of the most notable public speaking blunders. How many times has that statement been said? Unfortunately, the person saying it with confidence is usually ruing the day after attempting to “wing” a speech. Not only is a poorly organised talk difficult for listeners, it’s also downright unprofessional, especially if you’re being paid. How to Make Certain It Doesn’t Happen Twice: Always give yourself time to write and rewrite your speech. Unless you’re only provided with a minute or two of prep time (as may be the case if the speech is impromptu), there’s no reason not to have your information in order. This statement may be true, but people don’t enjoy public speakers who speed through their talks as though they are trying to win oratory races. Besides, when someone rapidly converses with an audience, words can be lost through poor enunciation… and attention can be lost, too. How to Make Certain It Doesn’t Happen Twice: If you have a naturally quick cadence, practice (off- and onstage) slowing down your speech patterns. Difficult audience members are part and parcel of being a public speaker. But how you deal with them will directly reflect your acumen. If you simply ignore a Chatty Cathy or an Angry Antoine, your audience will lose respect for you and wind up feeling uncomfortable. How to Make Certain It Doesn’t Happen Twice: When you have someone in your audience who simply can not behave, you have a few choices. You can either ask him or her directly (in front of everyone) to “Save your comments for later due to our time constraints.” Or, if time and the situation permits, you can say, “Why don’t we take a five minute break?” and then privately tell the person in no uncertain terms that his or her constant interruptions are becoming problematic. No, this isn’t the most comfortable conversation you’ll ever have in your life. But you cannot allow a challenging personality to take control of your event. Can you imagine if you were this public speaker and you’d brought along tons of handouts and overheads? Be sure that you always ask questions of the event’s coordinators before giving a speech; otherwise, you could end up looking and feeling naive or foolish. How to Make Certain It Doesn’t Happen Twice: Every time you are expected to publicly speak, ask about the venue, the audience, the timeframe, the subject matter, and similar topics. Write down all the answers you receive and refer back to them as you’re putting together your speech. 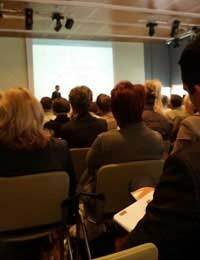 Of course, this technique (“lecture style”) is used all the time in public speaking, and some professionals would argue that it’s not a “mistake” but a choice. However, if you’ve ever been an audience member at a speech that was basically read and not orated, you understand how amazingly dull and frustrating it can be. How to Make Certain It Doesn’t Happen Twice: You don’t have to memorise your speech to deliver it while looking at your audience. You simply have to practice the method of looking down, quickly memorising a few lines, then looking up at your listeners and repeating what you read in a natural manner. The more you do this, the better you’ll get. Remember that you’re not the only person in the room. When giving a speech, you need to be considerate of your audience members; otherwise, they’ll eventually begin to take matters (such as needing a bathroom break or wanting to leave at the designated finish time) into their own hands. How to Make Certain It Doesn’t Happen Twice: If you’re giving a speech or talk that will last for a few hours, it’s best to break it up with 5-10 minute periods for audience members (and you!) to make phone calls, walk around, get a cup of coffee or tea, or use the restrooms. And always end at or before the proscribed time. How to Make Certain It Doesn’t Happen Twice: Use handouts and overheads to complement your talk, not as notes for you. In fact, keep such items to a minimum; too many public speakers have become reliant on these props to do “the work” for them. I had given a speech yesterday. It was really not the one I desieired it to be. I could not concentrate, anxiety mounted , my mouth was dry and this was very difficult to speak. I some how finished it bluntly and was much unhappy . I used to give frequesnt speeches and so this was more disappianting. Having been speaking in public for the last 65 years find that I do not need to use scripts, be it that it is one to one the same approach is the same. You are talking to people who are there to listen. It is wonderful when the audience interjects for it shows that they are listening. It is not in the sense public speaking. You are talking to people, be it to the world or on a bus. Never try to go over their heads. I have been towncrier, toastmaster, auctioneer etc and covered many subjects, but always with a smile on my face.